A few months ago, my friend Ankaret Wells self-published two books: The Maker’s Mask and The Hawkwood War. The books are part fantasy, part detective novel, part Regency romance and part cyberpunk, full of humour and populated with wonderfully vivid and three-dimensional characters. I particularly loved Ankaret’s heroine, Tzenni Boccamera, a shy, geeky engineer with a marvellously level-headed approach to problems and a great deal of determination, and I was inspired by a Twitter conversation to design some socks inspired by her. One of the first things we learn about Tzenni is that she is scared of heights, and particularly of staircases, which puts her at something of a disadvantage living in a world of vertical city-states, or Spires. So I knew straight away that the socks would have to have a staircase-like stitch pattern. However, I didn’t want Tzenni’s socks to define her just by her fears when I had been inspired by her awesomeness. Fortunately her society has a complex system of heraldic devices, and Tzenni’s personal symbol is a rose-glyph, so I took the Rosebud Lace from the first Barbara Walker Treasury, charted in in Excel and then added a framework of purl stitches around the rosebuds to represent the staircases. I’d never designed anything before, let alone written a pattern, but a few people on Ravelry asked if I was going to write this up, so I thought I’d give it a go. Once I’d made that decision I knew I wanted to offer the pattern to p/hop; I’ve had a great deal of pleasure from knitting p/hop patterns myself and I really hope that other knitters will enjoy knitting their very own Tzenni socks and knowing that they are helping MSF at the same time. Thank you Sadie. You can read more from Sadie on her blog, the Knitting up the Ravelled Sleeve of Care. 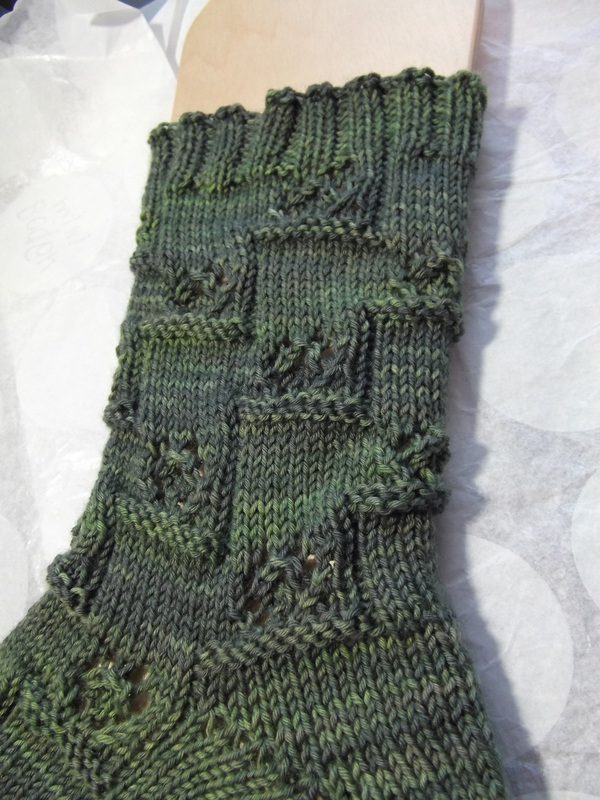 Lovely socks – thanks so much for donating the pattern.